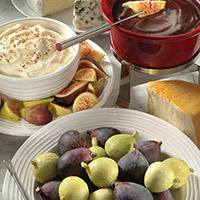 Light and elegant—fresh figs are dipped in a rich, almond-vanilla cream sauce. In small bowl with mixer at medium speed, beat heavy whipping cream until stiff. In large bowl with wire whisk, prepare instant pudding according to package directions using 1 cup milk. Gently fold whipped cream and almond extract into prepared pudding. Cut figs into quarters and dip into sauce.